Irritamenta: Numismatic Treasures of a Renaissance Collector by John Cunnally (Numismatic Studies 31, 2016). Bellinger, Alfred R. 1940. The Syrian tetradrachmes of Carcacalla and Macrinus.Numismatic Studies, no. 3. New York: American Numismatic Society. Hazard, Harry W. 1952. The numismatic history of late medieval North Africa.Numismatic Studies, no. 8. New York: American Numismatic Society. Bellinger, Alfred R. 1963. Essays on the coinage of Alexander the Great.Numismatic Studies, no. 11. New York: American Numismatic Society. Balog, Paul. 1964. The coinage of the Mamluk sultans of Egypt and Syria.Numismatic Studies, no. 12. New York: American Numismatic Society. Balog, Paul. 1976. Umayyad, ‘Abbasid and Tulunid glass weights and vessel stamps. Numismatic Studies, no. 13. New York: American Numismatic Society. Kleiner, Fred S. and Sydney P. Noe. 1977. The early cistophoric coinage.Numismatic Studies, no. 14. New York: American Numismatic Society. Thompson, Margaret. 1983. Alexander’s drachm mints I: Sardes and Miletus.Numismatic Studies, no. 16. New York: American Numismatic Society. Thompson, Margaret. 1991. Alexander’s drachm mints II: Lampsacus and Abydus. Numismatic Studies, no. 19. New York: American Numismatic Society. Scher, Stephen K. ed. 2000. Perspectives on the Renaissance medal.Numismatic Studies, no. 23. New York: American Numismatic Society. Beckmann, Martin. 2012. Diva Faustina: Coinage and Cult in Rome and the Provinces. Numismatic Studies, no. 26. New York: American Numismatic Society. Mossman, Philip L. 2013. From Crime to Punishment: Counterfeit and Debased Currencies in Colonial and Pre-Federal America. Numismatic Studies, no. 27. New York: American Numismatic Society. Tully, John A. N. Z. 2014. The Island Standard: The Classical, Hellenistic, and Roman Coinages of Paros. Numismatic Studies, no. 28. New York: American Numismatic Society. Elkins, Nathan T. 2015. Monuments in Miniature: Architecture on Roman Coinage. Numismatic Studies, no. 29. New York: American Numismatic Society. Bonine, Michael E. 2016. 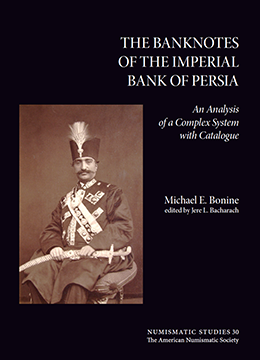 The Banknotes of the Imperial Bank of Persia: An Analysis of a Complex System with Catalogue. Numismatic Studies, no. 30. New York: American Numismatic Society. Cunnally, John. 2016. Irritamenta: Numismatic Treasures of a Renaissance Collector. Numismatic Studies, no. 31. New York: American Numismatic Society. Duyrat, Frédérique. 2016. Wealth and Warfare: The Archaeology of Money in Ancient Syria. Numismatic Studies, no. 34. New York: American Numismatic Society.